Ancient wisdom apparently has much to offer modern cloud application architects. This fragment was discovered in a shadowy basement in the Tel Aviv area of Israel. This finding clearly shows that ancient cloud application architects in the great talmudic academies of Babylon struggled with the transition away from classic databases. At the time, apparently, a widely used solution was known as Urim veTumim (“oracle”). Yet this database was unsuited for reliable use in cloud applications, and the text explores the reasons behind that unsuitability. 2. Achieving Oracle high availability on EC2 is a problem: there is no shared device, and relying on NFS is problematic. 3. 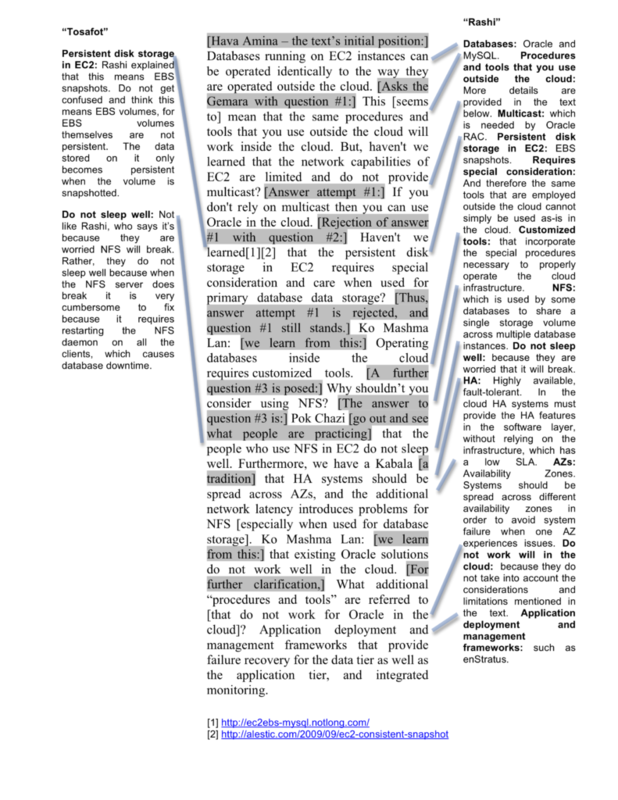 The cloud frameworks (enStratus, etc.) do not currently support Oracle. There’s kind of a limited audience for this but I have to say I really enjoyed it. It felt like it could use an eeka d’amri or two though.